**In 1919 England, in the shadow of The Great War, many look to the spirit world for answers. 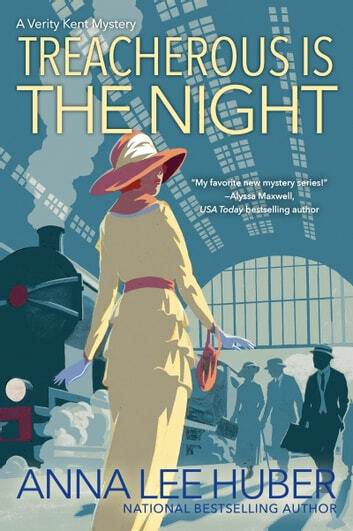 But it will take an all too earthbound intrigue to draw in the discerning heroine of Anna Lee Huber’s latest mystery **. . .
Then the medium is murdered—and Verity’s investigation is suddenly thwarted. Even Secret Service agents she once trusted turn their backs on her. Undaunted, Verity heads to war-torn Belgium, with Sidney by her side. But as they draw ever closer to the danger, Verity wonders if she’s about to learn the true meaning of till death do us part . . . The writer has a great knowledge of the events in WWI around Belgium and France. Characters are strongly developed and the writer has described the distraught emotions of people dealing with shell-shock , destruction and loss. A fascinating read. I'm a big fan of Anna Lee Huber's Lady Darby series and was not disappointed by her new Verity Kent mysteries. She has a wonderful style of writing that is both witty and entertaining. I couldn't help falling in love with her characters and once started, it's difficult to put her books down. I enjoy getting lost in the worlds she creates and look forward to the next novel! Treacherous is the Night is the second tale in A Verity Kent Mystery series. If you have not read This Side of Murder, you will not be lost. Everything a reader needs to know is included. Verity Kent is a strong and intelligent woman who served her country during the World War I. She believed her husband, Sidney was dead until he recently returned to the living (it is a long story). Sidney has not been forthcoming with Verity and she still resents what he put her through. Verity and Sidney have been changed by the war. Their marriage is suffering, and they need to communicate. Of course, they married in haste and have spent little time together since they said I do. Then there is the dashing Max Westfield who is attracted to Verity (if only Sidney had really been dead). I admit to not liking Sidney. He is a bully with a quick temper, and there is a lot of Sidney in this book. Anna Lee Huber is a detailed oriented writer which makes for a slow paced story. I found it challenging to wade through this historical mystery. I thought Treacherous is the Night lacked an ease to it. It seemed formal and stilted. The mystery is overly complex and the plot farfetched. There are a number of officers introduced and it is impossible to keep them all straight (they just blend together). I liked the clever clues left for Verity to find which she amazingly solves quickly. I enjoyed the Kent’s trip through Belgium with the descriptions of how the country looked after the war. I also liked how the author incorporated historical information into the story. I am giving Treacherous is the Night 3 out of 5 stars. While there are some interesting sections, I felt the book was a miss. I will let Verity continue on with her adventures without me.